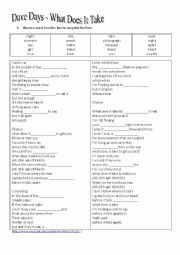 A reading comprehension worksheet, that children and teenagers can do and enjoy. They complete a chart with the information requested. You are free to use it and make the changes to wish. 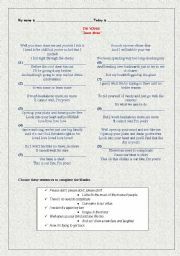 Children and teenagers can certainly enjoy doing this worksheet. 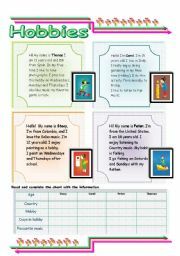 It is a reading comprehension worksheet about hobbies (free time activities) they complete a chart with the information requested. You are free to use it and make the changes to wish. 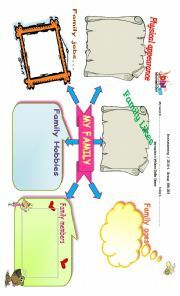 A worksheet to illustrate the parts of the house (labeling) and to practice THERE IS and THERE ARE. I want t thank Zailda For the template. http://www.eslprintables.com/printable.asp?id=371766#thetop Thank you! 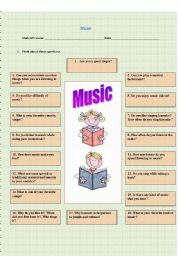 This is a worksheet to practice free writing about music. Learners must think and answer some addressing questions which guide them to write their own composition. You are free to make the changes you want. Enjoy it!!! 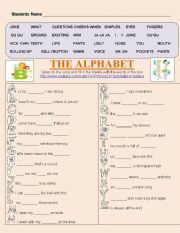 This is a reading a writing worksheet for young learners. 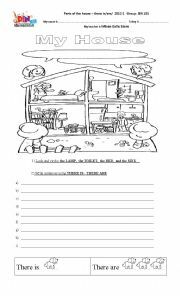 Here they can practice vocabulary about animals, colors, and numbers. 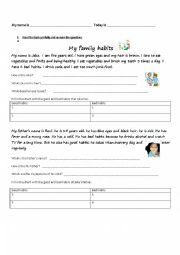 This is a reading and listening worksheet to practice symptoms, age, daily routines, godd and bad habits. Thanks for using it. An enjoyable song that children, teenagers and adults love, with this song you can practice some idioms and to sing it in order to get good pronunciation. You can also work on cultural issues and free time activities. This is a nice introduction and explanation for reported speech. it has clear examples with pictures. Hope you like it! 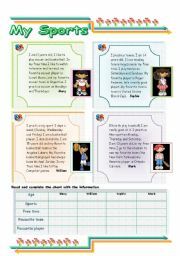 It is a PPT designed to explain the use of conditionals.It has good examples.